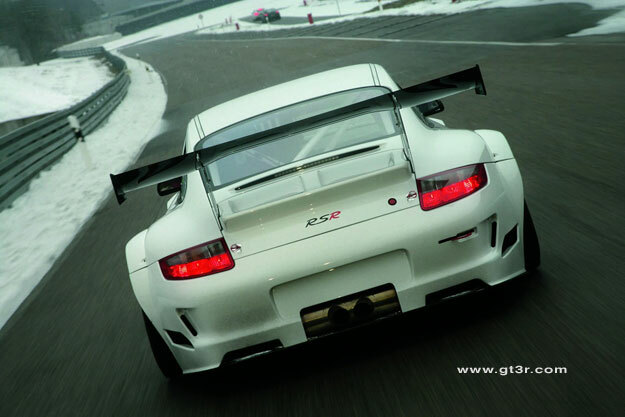 basis: Porsche 911 GT3 RS (997; street legal version), homologated from January 2009 onwards. butterflies; fuel injection; air restrictors 2 x 29.5 mm. Head and Neck Support; electric fire-extinguishing system. sword-type anti-roll bar on both sides; power steering. inner-vented, 380 mm in diameter; racing brake pads. inner-vented, 355 mm in diameter; racing brake pads. battery: 12 volt, 50 Ah, 140 Ah alternator. The successful Porsche 911 GT3 RSR takes off into the new model year with extensive modifications. The most powerful race car based on the Porsche 911, which last season secured wins in the American Le Mans Series and at the Nürburgring 24 Hours, competes in the GT2 class at international long distance races. The most distinguishing feature of the new GT3 RSR is the redesigned front with large air outlets on the front hood. Under the light-weight bodyshell, as well, major changes were made to the quickest 911. Noticeable at first sight are the air outlet slots, or the so-called louvers, on the front hood: an indication of the completely redesigned air ducting of the radiators, which became necessary through the new design of supply and discharge air with the installation of an optional air-conditioning unit. The aerodynamics under the rear underwent further optimisation. The rear wing now features a wider adjustment range. The weight-optimised brake system and the lighter wiring harness contribute to further improved handling, compared to the predecessor model. The capacity of the well-known six-cylinder boxer engine increased from 3.8 to 4.0-litres. After another reduction in the size of the air restrictors for the 2009 season, the engine now delivers around 450 hp (331 kW) at 7,800 revs per minute and develops a maximum torque of 430 Nm at 7,250 rpm. The rev limiter of the efficient six-cylinder unit kicks in at 9,000 rpm. Compared to the forerunner, the rev level for a given power output was significantly lowered. Thanks to this, the engine features an optimised torque curve and offers better driveability. In the cockpit, a new multi-function display located above the dashboard indicates the optimum moment to change gears. Another new feature is the programmable multi-function, onboard supply system control device, giving teams the choice of many individual functions. One of these is the infinitely adjustable blinking frequency of the lights in the front apron, which helps to immediately recognise race cars when they enter the pits in the dark. For easier servicing under race conditions, other modifications were made. The GT3 RSR now features a new air-jack system with overpressure valve. The oil refill with fast filling function has now moved to the rear lid, giving mechanics better access. The GT3 RSR (MY 2009) undergoes radical changes to the front end cooling system, with ducting in the hood, and revised front bumper. Now a 4.0L 6-cylinder powers the GT3 racer. 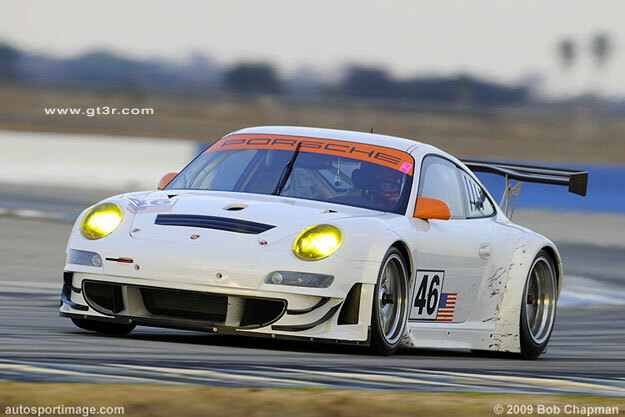 One of the 2009 GT3RSRs getting some break-in at Sebring 2009 testing in late January.